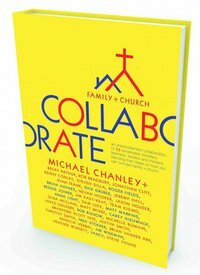 collaborate is the newest book from minister’s label publishing that combines the expertise of michael chanley and 34 teachers, ministers, leaders and thinkers on how to connect the church + family. i loved the practicality of this book, each chapter boasting a new idea for empowering the church, or encouraging parents, and i love the collaborative aspect of the book, some chapters contradict the others and that is just fine! it’s not about being right, it’s about sharing our best ideas. 2. as always, my mind drifted while reading this book to the non-traditional families in the church. as i read, i noticed that several of the practical ideas shared could be used to love and serve the single parent families, grandparent led families, gay and lesbian families, and divorced or widowed families in our churches. it’s my heart to see this family ministry movement grow to include the non-traditional families (which, technically now are the traditional families) so that all children and parents feel and know god’s love. i’m grateful for michael chanley and his collaborative spirit, and am planning to recommend this book to friends and churches looking for new ideas in family ministry. I love the same things you love about this book! Great review! Awesome review Amy! I, too, was so glad to see some stuff that could be applied to more non-traditional/non-evangelical looking families.